The Donner Party started out with prosperity, happiness, and hope for a new future on the west coast. Unfortunately, these feelings are short lived since the mysterious death of a young boy acts as an omen for worse things to come. Normal, expected things happen such as depleted rations, drought, hidden secrets threatening to ruin relationships and reputations, and plain bad luck in choosing to take a supposed short cut. However, something isn't right. Members of the group start to disappear. Is it madness, animals, or something much more sinister? The Hunger takes a horrific historical event and infuses it with supernatural dread and rich backstories for each character. The Donner Party was comprised of several different families, but the most influential and powerful were the Donner's and Reed's who fight for supremacy. Through the narration bouncing from person to person, each character's inner thoughts, feelings, secrets, and motivation. Everyone has some sort of earth shattering dark secret from cheating to financial ruin to closeted homosexuality that leads each person to find a new life so far from established civilization. Being inside each character allows us to see why they might not take completely logical choices and opt for ways to safe face, keep themselves above others, and keep the masses appeased, which is the most important since not much gets them to be at each others' throats. My two favorite characters are Charles Stanton and Tamsen Donner. Charles is the main character of the novel and he is harboring a deep dark secret about the woman he loved who died. He promised her in life to never tell it and he's shockingly noble in doing so to the detriment of his own reputation. This on top of not being associated with any of the major factions in the party lead to him being an underdog who runs the risk of being ostracized despite his sound, logical advice. Charles is so easy to like and root as the party goes off the rails. Tamsen, on the other hand, isn't the most moral and pure character in comparison, but it was refreshing to see a woman who isn't a shrinking violet She is completely sure of herself and manipulates those around her with confidence. Her good looks and ability to fake being what people think a woman should be serves her well even though underneath, she is much different. She's unsatisfied with her marriage and her worth being tied to a man. Of course, she's eventually suspected of being a witch due to her penchant for seducing men and her use of protective charms. This character could have easily been a flat seductress, but she proved to be so much more. The supernatural elements make the already insane story even more terrifying. The party faces starvation, little access to fresh water, dwindling resources, and extremely cold temperatures. On top of these practical, realistic things, a sort of disease can be contracted by both animals and humans that causes them to have an insatiable hunger. The condition is a hybrid of a zombie and a wendigo where the infected slowly succumbs to complete inhumanity and hunger. They can survive much more extreme conditions and injuries than uninfected. Although I felt it took a bit too long to get to them, these creatures are so creepy and threaten these already very vulnerable people. Since they wear the faces of loved ones and people they've been travelling with for literally months, it's hard for the otheres to see them as a threat instead of just sick friends or acquaintances until it's too late. 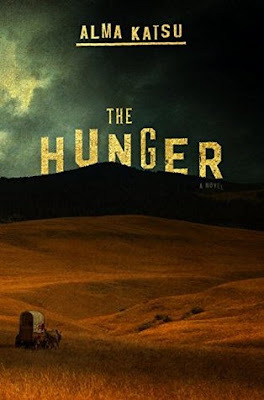 The Hunger is a chilling story of ill advised travel, creatures, and survival. Each character has a rich backstory and unique motivations. However, the fact that literally everything about this is spelled out and nothing is implicit or left for the reader to fill in even some small details felt weird to me. Other than that, Katsu does such a good job of portraying the hopeless nature, desperation, and eldritch horror of this situation. It also makes me interested in researching the historical event and seeing how exactly she blended the real history with the more fantastical elements.